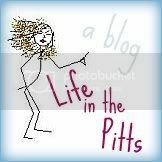 Life in the Pitts: Oh heck yes, I got the job! .....and then gave away the ending of my story in this title. crap. Oh heck yes, I got the job! .....and then gave away the ending of my story in this title. crap. On Friday there was an official-looking envelope on my desk. It made my nervous. But when I finally worked up the courage to open it, I found out that I had been hired on at my job! Like, for real. Remember back in december, when I unexpectedly got this job? They didn't really hire me. They said it was a trial basis, and they would let me know if they still liked me in 6 months. Which is good, because I am probably the least-motivated job hunter in existence. I couldn't even get Michaels to hire me, and I live across the street. And yet, I have a lifestyle involving craft supplies and Netflix rentals that I am just not willing to give up. ......it's times like these that make me grateful for my pole dancing class. I will always have that to fall back on. Congrats!!! Keep us updated!! Enjoy the rest of your weekend! You live across the street from Michaels?!? I am OFFICIALLY jealous. The closet one to me is a 30 minute drive. That's so funny! I understand that completely. I probably should get out and find a real job, but that would take a lot of energy. I'd rather stay home and sew! God knows my heart! Anyway I finally posted about my awesome checkerboard! Ignore that May 25th date, I just now posted it! http://mimisbabiesgifts.blogspot.com/2010/05/checkerboard-win.html Thanks again! A small part of me wishes you didn't get the job so that you could put your new talent to use.